One of the good things you get on Google's Blogger platform is a decent set of statistics by way of traffic analysis to your site. I took a look at this for the first time in a while and found a some interesting numbers. It has to be said, this is by no means a failsafe way to identify incoming traffic, as both browser and operating system identification can be spoofed for a variety of legitimate reasons (blame software standards or the lack thereof). These stats mostly confirm what I believe of the readership; the majority are Linux users which makes sense given the bias of content is toward Linux platforms and Open Source topics. 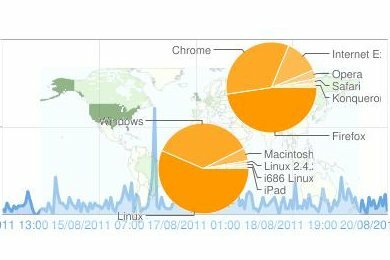 There is a fair chunk of Windows users attracted to the more general articles and I suspect, cross-platform topics such as Chrome, Android, opinion posts, and others. Moreover, I suspect that many of those Windows users are independent-minded, since the percentage of Internet Explorer is very low, suggesting a goodly number of Windows users have migrated off IE for Firefox and Chrome/Chromium. There's a very small showing of Macintosh/Safari users coming in, although 3% Mac is higher than I expected, clearly some of those users have migrated off Safari (only 2%) for another browser. Opera and Konqueror (on KDE) are very much minority players. I have no idea who the cutting-edge GranParadiso (Firefox 5) users are or where they're from! I don't know whether to be surprised at the numbers of mobile browsers and devices or not. I've a suspicion the iPhone/iPad audience may be occasional visitors or those with multiple devices. The small number of Android and HTC visitors may reflect the reality that few people are actually using mobile devices for anything more than email, Facebook and looking up cinema showings.